Labour’s manifesto offers a vision to radically improve the lives of millions. The Labour Party has never been a socialist party, but it has always had socialists in it, and for the first time they are in the driver’s seat. This has been crystallized by the party’s 2017 manifesto. Entitled “For the Many, Not the Few” it represents the peak accomplishment of Corbynism to date and offers the British people a first opportunity in a generation to vote for policies that would signify a fundamental shift to the left. Though moderate in language, the manifesto’s proposals are radical; building on the promise of Jeremy Corbyn’s two leadership campaigns with a vision that would end the era of austerity and shape a new economic terrain, one that shifts wealth and power from capital to workers. And the evidence suggests it is extremely popular. In the week it was launched the full, 128-page manifesto went viral online, being shared tens of thousands of times. It was much better received than the Conservative equivalent and has catapulted Labour in some polls to within five points of the governing party. After eighteen months of difficulty, Corbyn’s Labour has found itself on firm ground for the first time. But what does the manifesto propose — and how can its vision be realized? The manifesto’s offer is threefold: to nationalize key utilities whose privatization has driven up the cost of living; to overhaul the world of work, halting the race to the bottom in terms and conditions; and to build a social economy where the essentials necessary for living a dignified life — from education and housing to social care and welfare supports — are improved and, in many cases, made free to access. Labour proposes to take rail, mail, energy, and the provision of water back into public ownership. It will increase the minimum wage to ten pounds per hour, scrap zero-hours contracts, ban unpaid internships, give workers’ rights to the self-employed, and trade unions a right of access to the workplace. Under a Labour government one million homes would be built, half of them publicly owned. Rent controls would be introduced. Tuition fees for university would be scrapped, there would be free child care for children over two, free school meals for every primary school child, and a national education service that invests £6.3 billion into improving schools. The National Health Service would be renationalized, driving out privateers, and its hospitals would no longer charge for parking. The elderly would have their pensions guaranteed with a triple lock and £2 billion would be invested in social care. Welfare cuts would be reversed. To achieve this transformative social program, the manifesto returns to the old-time gospel of the labor and social-democratic tradition: redistribution of wealth. The £52.5 billion raised to pay for it will come from taxes on corporations and those earning over £80,000 per year, as well as proposals such as a campaign against tax avoidance and fraud, the “Robin Hood Tax” on financial institutions, and a levy on private school fees. The vast majority of British people would benefit from a program paid for by the top 5 percent. To the many, from the few. In contrast to recent manifestos, “For the Many, Not the Few” is a decisive shift to the left in the party’s aspirations for government. In the two years since the last election Labour’s policy has developed from attempts to ameliorate the effects of neoliberalism to root-and-branch reform to defeat it. Where Ed Miliband’s Labour pledged to cap energy prices (a policy decried as Marxist at the time), Corbyn’s Labour pledges to intervene directly in the energy market through the creation of regionally owned and democratically controlled energy companies alongside the re-nationalization of the National Grid. Two years ago, Miliband and Balls sought to end only those zero-hour contracts which were “unfair.” Today, Corbyn and McDonnell seek their abolition entirely. Labour entered the general election of 2015 on a pledge to reduce tuition fees but are now committed to free higher education. If Brexit was a vague and contradictory call to “take back control,” Labour’s program is the route to achieving it, recovering an alternative long buried by Thatcherism. It takes its inspiration from the most radical aspect of social-democratic politics — decommodification — and aims to remove staples of daily life from the market, making them public, universal, and free at the point of access. In doing so, the party’s program would radically lower the cost of living, placing workers under less pressure to accede to the demands of their bosses to work longer or for less. It would revive the idea of entitlement that conservatives have fought so hard to discredit and put the brakes on a slide towards an economy where even public goods are provided on a pay-per-service basis. It could also change how people relate to the provision of necessary things, challenging the idea that this must be done on the basis of exchange, where what you receive always relates to what you can afford. 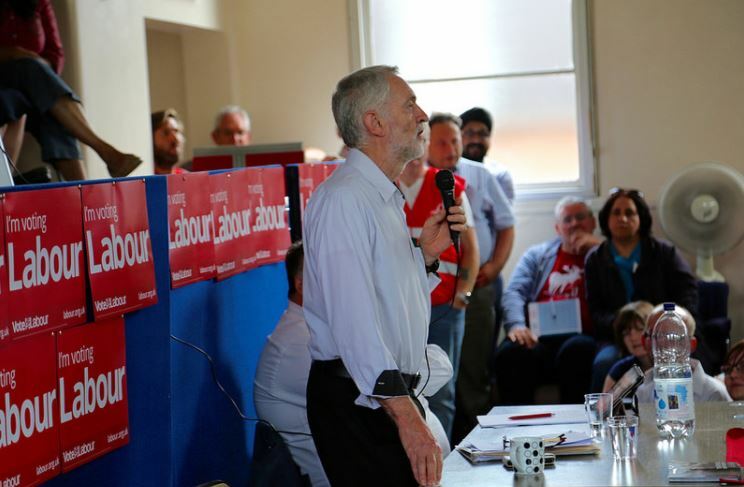 Jeremy Corbyn has confounded his critics in this election campaign. Almost two years of constant attacks by the British press and undermining by his party’s right wing had left him floundering in the polls, trailing the Conservatives by 24 points (48-24) when the election began. In that same poll Jeremy Corbyn was an enormous 52 points behind Theresa May in personal approval ratings. Yet by the day before the terrorist attack in Manchester earlier this month, he had managed to close that gap almost completely, trailing the prime minister by only two points. He is now the most popular Labour politician in the country, comfortably beating any potential rival for leadership. This staggering turnaround owed in large part to the manifesto, which has proven hugely popular. A recent poll by ComRes shows that 52 percent of the electorate favor the renationalization of Britain’s railways, with just 22 percent against. The same poll indicated support from exactly half the electorate for the return of Royal Mail into public ownership. A further 71 percent said they supported making zero-hour contracts illegal, and 64 percent supported Labour’s call for a rise in income tax for those earning over £80,000 a year. The only policy polled by ComRes that did not have support from an outright majority was Labour’s promise to bring Britain’s energy industry under public ownership and control, with 49 percent in support and 24 percent against. It has also exposed Theresa May, once portrayed as the safe pair of hands needed to steer the good ship Brexit to shore, now not only incapable of communicating her political vision to the people but appearing incompetent on the question of bringing it into being. Her decision to avoid debating Corbyn is likely to damage her already dreadful campaign even more in the coming days. For the first time in decades, we can be certain what a left-wing Labour government means to do. There is a live opportunity to build a project, over years, that could improve the lives of millions of people in a society worth living in. The onus is on the Left across Britain to keep this vision on the horizon — whatever happens on June 8 — to organize for it, and to win. Max Shanly is a Jacobin contributor. He is a member of the Young Labour National Committee and was a senior organizer in the second Jeremy for Leader campaign. Ronan Burtenshaw is Europe editor at Jacobin .